Periodontal diseases are polymicrobial diseases that cause the inflammatory destruction of the tooth-supporting (periodontal) tissues. Their initiation is attributed to the formation of subgingival biofilms that stimulate a cascade of chronic inflammatory reactions by the affected tissue. The Gram-negative anaerobes Porphyromonas gingivalis, Tannerella forsythia and Treponema denticola are commonly found as part of the microbiota of subgingival biofilms, and they are associated with the occurrence and severity of the disease. P. gingivalis expresses several virulence factors that may support its survival, regulate its communication with other species in the biofilm, or modulate the inflammatory response of the colonized host tissue. The most prominent of these virulence factors are the gingipains, which are a set of cysteine proteinases (either Arg-specific or Lys-specific). The role of gingipains in the biofilm-forming capacity of P. gingivalis is barely investigated. Hence, this in vitro study employed a biofilm model consisting of 10 subgingival bacterial species, incorporating either a wild-type P. gingivalis strain or its derivative Lys-gingipain and Arg-gingipan isogenic mutants, in order to evaluate quantitative and qualitative changes in biofilm composition. Following 64h of biofilm growth, the levels of all 10 species were quantified by fluorescence in situ hybridization or immunofluorescence. The wild-type and the two gingipain-deficient P. gingivalis strains exhibited similar growth in their corresponding biofilms. Among the remaining nine species, only the numbers of T. forsythia were significantly reduced, and only when the Lys-gingipain mutant was present in the biofilm. When evaluating the structure of the biofilm by confocal laser scanning microscopy, the most prominent observation was a shift in the spatial arrangement of T. denticola, in the presence of P. gingivalis Arg-gingipain mutant. The gingipains of P. gingivalis may qualitatively and quantitatively affect composition of polymicrobial biofilms. The present experimental model reveals interdependency between the gingipains of P. gingivalis and T. forsythia or T. denticola. Periodontal infections, or periodontal diseases, are a set of chronic inflammatory diseases that destroy the tooth-supporting (periodontal) tissues. They are caused by oral bacterial biofilms attaching on the tooth surface. They have the capacity to trigger a series of inflammatory responses, which may destroy the gingival tissue and the alveolar bone supporting the tooth, if they become exacerbated ,. With regards to its capacity as an ecological niche, the oral cavity can be colonized by more than 700 species  and approximately 500 of those can be present within the forming biofilms ,. Among the biofilm-associated microbiota, earlier clinical epidemiological studies have demonstrated that three species in particular, also designated as the red complex, are more associated with periodontal disease than others. These are namely Porphyromonas gingivalis, Tannerella forsythia, and Treponema denticola. They are all Gram-negative anaerobes, with a high proteolytic activity . Among these three, P. gingivalis holds a prominent role in orchestrating the virulence of the biofilm and the consequent tissue inflammatory response, earning itself the characteristics of a keystone periodontal pathogen ,. P. gingivalis expresses several virulence factors, including, fimbriae, LPS, and its cysteine proteases, namely gingipains . These include the arginine-specific proteinases RgpA and RgpB, and the lysine-specific proteinase Kgp, which represent the majority of the cell-surface proteinases of P. gingivalis. Clinical studies have demonstrated that periodontal infection associated with P. gingivalis can result in significantly elevated systemic antibody response to the gingipains ,. When growing in a subgingival (below the gingival margin) biofilm under strict anaerobic conditions, P. gingivalis is highly dependent on its gingipains for utilizing free amino acids as a source of carbon and nitrogen . Moreover, unlike other gram-negative bacteria, P. gingivalis does not produce siderophores to sequester and transport iron but its gingipains mediate the uptake of iron from hemoglobin, heme proteins, and ferritin ,. Gingipains are also considered important in the capacity of P. gingivalis to evade host defences, by degrading antibacterial peptides, such as neutrophil-derived α-defensins, complement factor, such as C3 and C4, T cell receptors, such as CD4 and CD8 . Alternatively, P. gingivalis and its gingipains can subvert the host immune response by proactively manipulating host molecules, particularly of the complement ,. For instance, P. gingivalis may perturb the cross-talk between C5a receptor and toll-like receptor signalling in order to prevent bacterial clearance and cause dysbiosis , eventually resulting in periodontal bone loss ,. The construction and phenotypic analysis of isogenic protease mutants of P. gingivalis have confirmed putative functions for these proteolytic enzymes . In vivo studies using the P. gingivalis mutant strains in animal models have reinforced the view that the gingipains can modulate the infection process -. In vitro studies have demonstrated an involvement of the gingipains in the regulation of inflammatory mediators from various host cells, including IL-1 α, IL-1β, IL-18 , receptor activator of NF-κB ligand (RANKL) -, tumor necrosis factor-α converting enzyme (TACE) , protease-activated receptor (PAR)-2 , or soluble triggering receptor expressed on myeloid cells (sTREM)-1 . Understanding how different organisms act within a given polymicrobial biofilm brings us closer to understanding the etiological mechanisms of periodontal disease . That is because interactions among different bacterial cells can determine the structural characteristics, maturation and virulence of the biofilms -. These interactions can occur at several levels, including physical contact, metabolic exchange, and signal-mediated communications . Additionally, species-specific virulence factors may regulate bacterial growth, hence altering the conditions of the ecological niche for biofilm formation. In this respect, most studies involving gingpains have focused on P. gingivalis as a single species, which might overlook the bacterial interactions within a complex biofilm community. Therefore, the present study used a 10-species subgingival biofilm, aiming to investigate the role of gingipains on the growth and structure of the biofilm, by incorporating P. gingivalis gingipain-deficient strains. The numbers for each individual species within the different biofilm groups were quantified either by fluorescence in situ hybridization (FISH) or by immunofluorescence (IF). The growth of P. gingivalis was not affected depending on whether the wild-type or the gingipain-deficient strains were used. Statistically, compared to the wild-type strain, the P. gingivalis gingipain-deficient strains did not cause significant changes in the growth of the remaining nine-biofilm species in the biofilm, with the exception of T. forsythia (Figure1). 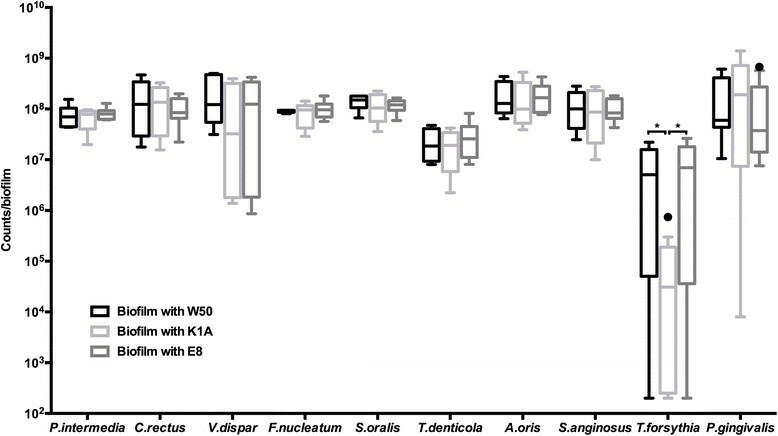 In particular, the presence of the Lys-gingipain deficient strain K1A caused a significant (P < 0.01) reduction of T. forsythia cell numbers, compared to the wild-type W50, or the Arg-gingipain-deficient strain E8 (29.9-fold and 38.6-fold, respectively). However, no significant differences in T. forsythia numbers were observed between the wild-type W50 and the Arg-gingipain-deficient E8 biofilm groups. Bacterial numbers of each species in the biofilms. Numbers of each strain were counted by epifluorescence microscopy, following staining by FISH or IF. Data was plotted on a logarithmic scale. Asterisk (*) indicates significant differences (P < 0.01) between the groups. Open circle indicates data points considered as outliers. Groups are defined by the use of the corresponding P. gingivalis strain (W50; wild-type, E8; Arg-gingipain-deficient mutant, K1A; Lys-gingipain-deficient mutant). Having identified that a dependency exists between the Lys-gingipain and the growth of T. forsythia, we further investigated the structure of the biofilm by means of confocal laser scanning microscopy (CLSM), and evaluated changes in the presence of the P. gingivalis gingipain-deficient strains. Firstly, the focus was placed on the structural association or localization between P. gingivalis and T. forsythia. Within the biofilm structure, P. gingivalis appeared in variable size aggregates or clusters of its own species, with no marked differences observed between the wild-type W50 and the gingipain-deficient strains (Figure2). The distribution pattern of T. forsythia was in more scattered clusters, observed often in the immediate vicinity of P. gingivalis clusters, but not strongly intertwining each other (Figure2). This pattern was observable irrespective of the use of P. gingivalis wild-type W50 or the Arg-gingipain deficient strain E8, whereas when the Lys-gingipain deficient strain K1A was included in the biofilm instead, this association was less obvious (Figure2), presumably due of the low T. forsythia numbers. Localization of P. gingivalis and T. forsythia within the biofilms. Multiplex IF staining was performed for P. gingivalis (red) and T. forsythia (green). Groups are defined by the use of the (A) wild-type, (B) Arg-gingipain-deficient mutant, (C) Lys-gingipain-deficient mutant P. gingivalis strain in the biofilm. Scale bar length: 20 μm. 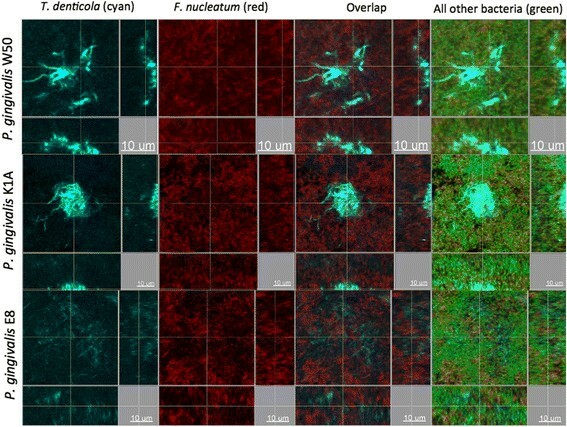 It was of further interest to investigate the localization of T. denticola within the biofilm structure, as the third member of the red complex cluster. Interestingly, T. denticola formed aggregates or clusters in the presence of the P. gingivalis wild-type strain W50, as was the case also when the Lys-gingipain deficient strain K1A was used. However, in the presence of the Arg-gingipain deficient strain E8, T. denticola lost this cluster-like conformation in the biofilm, and acquired a more even and thread-like distribution (Figures3 and 4). Fusobacterium nucleatum was also strongly present throughout the biofilm and appeared to be evenly distributed among these T. denticola structures (Figure4). Localization of T. denticola within the biofilms. IF staining was performed for T. denticola (cyan). Groups are defined by the use of the (A) wild-type, (B) Arg-gingipaindeficient mutant, (C) Lys-gingipain-deficient mutant, P. gingivalis strain in the biofilm. Scale bar length: 20 μm. Localization of P. gingivalis, F. nucleatum and T. denticola within the biofilms. IF staining was performed for T. denticola (cyan), F. nucleatum (red) and YoPro-1 iodide & Sytox Green mixture for all other bacteria (green). Groups are defined by the use of the corresponding P. gingivalis strain (W50; wild-type, E8; Arg-gingipain-deficient mutant, K1A; Lys-gingipain-deficient mutant) in the biofilm. Scale bar length: 20 μm. As it is well established that periodontal diseases are initiated by a mixed-species biofilm ,, in vitro biofilm models, may be more accurate in studying the causative factor of the disease, than single species in planktonic form ,,. The present study investigated the involvement of P. gingivalis gingipains in the quantitative and qualitative composition of a polymicrobial biofilm consisting of 10 species that are frequently comprising part of the subginvival microbial flora. Among their many properties, gingipains are important for the growth of P. gingivalis and as transporters for iron . While in planktonic culture P. gingivalis gingipain deficient strains require longer doubling times , their incorporation into a polymicrobial biofilm did not yield differences in numbers, compared to the wild-type strain. Hence, the growth characteristics of P. gingivalis may differ depending on whether it grows in planktonic or biofilm state. When present in a biofilm, gingipains do not appear to be crucial for the growth of P. gingivalis, as shown here. Interestingly, among the remaining nine species in the biofilm, the only one whose growth was affected by the presence of gingipains was T. forsythia. In particular, the P. gingivalis Lys-gingipain deficient strain resulted in a strong reduction in T. forsythia numbers after 64h of biofilm growth. Reversely, this indicates that the Lys-gingipain produced by P. gingivalis has an additive effect on the growth of T. forsythia in the biofilm. This denotes a synergistic association between T. forsythia and P. gingivalis as mutual components of a polymicrobial community, which is mediated by the Lys-gingipain of the latter. Previous studies have shown that gingipains are crucial for the co-aggregation of P. gingivalis or its co-adhesion with other species, such as T. denticola-, or for the invasion of host cells . Hence, the gingipains may not only affect the quantitative composition but also the structural conformation of the biofilm. For this reason, the biofilm architecture was also investigated by CLSM. P. gingivalis occurred in distinguishable and evenly distributed clusters within the biofilm regardless of whether it expressed a gingipain or not. The communities of T. forsythia within the biofilm exhibited similar patterns to those of P. gingivalis, and were frequently co-localized, yet without impinging onto each other. The proximal association of these two species communities in biofilm may hint for an ecological relationship. This is also substantiated by the notable absence of T. forsythia clusters from the vicinity of the Lys-gingipain deficient P. gingivalis. Hence, this gingipain may be important for the growth of T. forsythia and its spatial interdependency to P. gingivalis within the biofilm. This observation could represent an example of the metabolic responses and bacterial quorum-sensing within the biofilm . Another interesting observation of the present study is that of the structural re-arrangement of T. denticola in the biofilm, depending on the presence or absence of the Arg-gingipain. Earlier studies have shown that other species can interact with P. gingivalis in both planktonic suspensions and biofilms ,,. A recent study using the similar multi-species biofilm model as here demonstrated that P. gingivalis and T. denticola have the tendency to co-colonize gingival epithelial tissue . In a dual P. gingivalis - T. denticola biofilm, it was also demonstrated that gingipains do contribute to their interaction . In the present experimental model, T. denticola cells formed dense circular clumps with the wild-type P. gingivalis strain. However, in the presence of the P. gingivalis Arg-gingipain deficient strain, this conformation was lost and T. denticola cells were instead arranged in looser threaded structures, even though their numbers in the biofilm were not changed. This finding provides further evidence of the ecological association between P. gingivalis gingipains and the structural arrangement of T. denticola in the biofilm. It is difficult at this stage to interpret the biological meaning of this change in T. denticola structure. Of note, in a recent study using the similar biofilm model it was demonstrated that omission of streptococci from the biofilm resulted in numeric changes of P. gingivalis and P. intermedia. The latter also lost its aggregated form and was arranged in filamentous long chains, resembling those of the missing streptococci . This study showed that the gingipains of P. gingivalis promote quantitative and qualitative shifts in the composition and structure of a multi-species biofilm. More specifically, the Lys-gingipain enhances the growth of T. forsythia, whereas the Arg-gingipain promotes the aggregation of T. denticola in the biofilm. These ecological interactions are interpreted as synergistic ones, and may support the survival and the virulence of the biofilm community as a whole. The method used to develop 10 species biofilm is a modification of a previous report of this model , with major changes described below. The following strains were used in this study: Prevotella intermedia ATCC 25611T (OMZ 278), Campylobacter rectus (OMZ 398), Veillonella dispar ATCC 17748T (OMZ 493), Fusobacterium nucleatum subsp. nucleatum (OMZ 598), Streptococcus oralis SK248 (OMZ 607), T. denticola ATCC 35405T (OMZ 661), Actinomyces oris (OMZ 745), Streptococcus anginosus ATCC 9895 (OMZ 871), T. forsythia (OMZ 1047), P. gingivalis W50 (OMZ 308), P. gingivalis K1A (OMZ 1126) and P. gingivalis E8 (OMZ 1127). The latter two are genetically modified strains of P. gingivalis W50, with a deletion of Lysine-gingipain (kgp) and Arginine-gingipain (rgpArgpB) genes, respectively . Each of the biofilm groups in this experimental design contains one of the three P. gingivalis strains and all other 9 species. For biofilm formation, 200μl of bacterial cell suspension, containing equal volumes and densities (OD550 = 1.0) of each strain were added onto pellicle-coated hydroxyapatite discs (diameter 5mm), in 1.6ml growth medium supplemented with 0.5% hemin, as described earlier . The medium was renewed after 16h and 24h, during the total incubation time of 64h. The discs were dip-washed three-times daily. After 64h of incubation, the biofilm discs were ready to be harvested. For quantification of the bacterial numbers in the biofilm, the discs were vigorously vortexed for 2min in 0.9%NaCl and then sonicated at 25W in a Sonifier B-12 (Branson Sonic Power Company) for 5sec. For confocal laser scanning microscopy (CLSM) of the biofilm structure, the discs were dip-washed and immediately fixed in 4% paraformaldehyde (Merck, Darmstadt, Germany) at 4C for 1h before being processed for fluorescence in situ hybridization (FISH) or immunofluorescence (IF) analysis. The bacterial suspensions were diluted, fixed on the slides, stained and counted as described ,. For FISH staining, slides were fixed at 4C with 4% paraformaldehyde in PBS for 20 min and for IF staining they were fixed at room temperature with methanol for 2min, before they were incubated with the antibodies at 37C. FISH was used for the evaluation of S. oralis, S. anginosus and V. dispar (oligonucleotide probes listed in Table1), while IF was used for the evaluation of T. denticola, C. rectus, T. forsythia, P. gingivalis, P. intermedia, F. nucleatum and A. oris (antibodies listed in Table2). FA; Formamide concentration in the hybridization buffer. For FISH, the fixed samples were first pre-hybridized, with hybridization buffer containing 0.9M NaCl, 20mM Tris/HCl (pH7.5), 0.01%SDS, formamide (as indicated in Table1) at 46C, for 15min. Following this step, hybridization was performed using specific oligonucleotide probes (Table1) at the same temperature, for 3h. Thereafter, the samples were incubated at 48C with pre-warmed wash buffer containing 20mM Tris/HCl (pH7.5), 5mM EDTA, 0.01% SDS, and 40159mM NaCl for 30min. For CLSM and image analysis, the samples were counterstained with a mixture of 3 M YoPro-1 iodide (Invitrogen, Basel, Switzerland) and 15 M Sytox Green (Invitrogen, Basel, Switzerland) then embedded with 10μl Mowiol  with the biofilm surface facing towards the chamber slides. Prior to qualification, the samples were coated with mounting buffer consisting of 90% ultrapure glycerol and 10% 25mg/g DABCO (Sigma-Aldrich, Buchs, Switzerland), on 24 well slides, Finally, the stained bacterial cells were visualized under an Olympus BX60 fluorescence microscope (Olympus Optical AG, Volketswil, Switzerland), at 100 magnification. The box-plot data presented derives from four independent experiments each performed in triplicate biofilm cultures. The values were logarithmically transformed, and then inserted to Prism v.6 software (GraphPad, La Jolla California USA). The statistical differences between the groups were calculated by one-way ANOVA, using the Tukeys post-hoc test for multiple comparisons (P≤0.01). For evaluation of the biofilm structure, CLSM was used for each one of the four independent experiments. The biofilm-containing discs stained by FISH or IF were visualized using a Leica SP-5 microscope at the Center of Microscopy and Image Analysis of the University of Zrich (ZMB), with a resonant scanner system (8000Hz), a diode laser (405nm excitation), an argon laser (458nm/476nm/488nm/496nm/514nm excitation) and a helium neon laser (561nm/594nm/633nm excitation). Filters were set to 500540nm, 570630nm, and 660710 for detection of YoPro-1 iodide & Sytox Green mixture, Cy3 and Cy5, respectively. All images were captured using a 63 × objective (glycerol immersion, NA 1.3). Stacked images were further processed using the Imaris 7.4.0 software (Bitplane, Zrich, Switzerland), in order to virtually reconstruct the biofilm structure. NB and GNB conceived the study. BK, GNB, TT, JAO, MAC and NB designed the study. JAO and MAC generated and provided the Porphyromonas gingivalis gingipain mutants. BK performed the experiments. BK and NB performed the data analysis. BK, GNB and NB wrote the paper. TT, JAO and MAC reviewed and approved the final version of the paper. All authors read and approved the final manuscript. We thank the Centre of Microscopy and Image Analysis (ZMB) of the University of Zrich for their support with confocal microscopy. This study was supported by the authors Institutes, the Forschungskredit Grant of the University of Zrich (NB), and the Medical Research Council UK grant MR/J011118/1 (MAC).